Dry Gulch is the mountainous equivalent of a secret room hidden behind a revolving bookcase. Tucked between Herman Gulch and the Eisenhower Tunnel along I-70, Dry Gulch is easy to access — simply pull off exit 216 just east of the Eisenhower Tunnel and turn right onto a dirt road before crossing under the highway. There is no formal trailhead, just a gate where cars must park. This is where the adventure begins. (Please be careful if you have dogs, as this spot is about 15 feet from the rushing traffic of I-70). The most intriguing destination is the extensive plane wreckage from the tragic 1970 Wichita State crash. The Martin 4-0-4 smashed into the side of Mount Trelease on October 2, 1970, killing 31 of the 40 people on board. 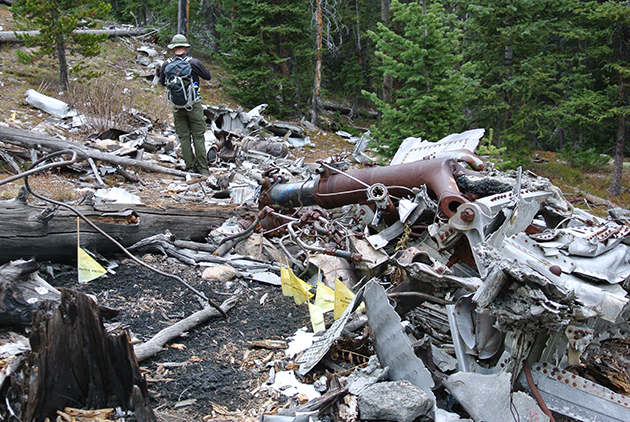 Forty-four years later, there is still extensive debris and a few memorials at the crash site. 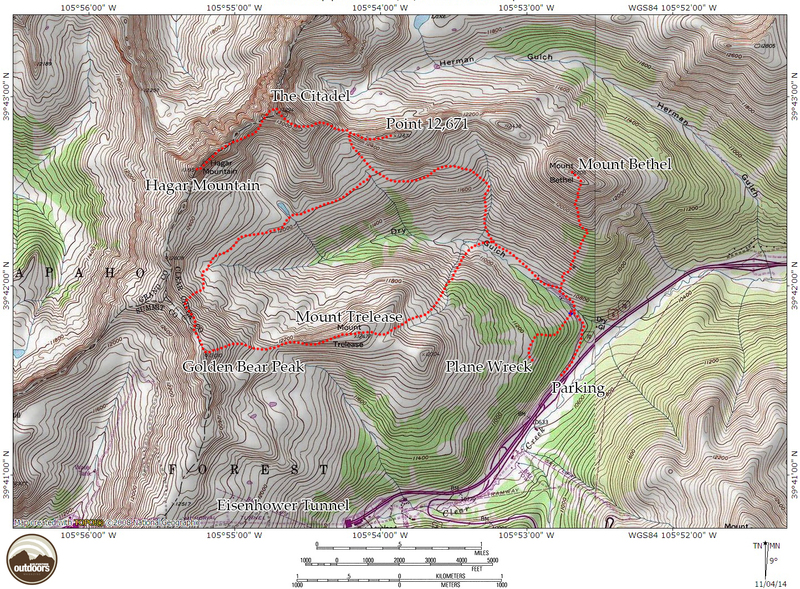 For those hoping to explore the wreckage, it’s about a 35 minute hike from the parking area. From the gate, hike up the dirt road 5 minutes, where a fenced-in storage area will be on the right. Just before this, off the main road, is an unmarked but obvious trail that heads steeply uphill into to the woods to the west. This trail gains 600 vertical feet and is 0.9 miles from the parking area before flattening out and turning south (left) to the crash site. Please be respectful of the modest memorials left behind within the debris field. For a more detailed write up with directions on how to reach the crash site, visit the Wichita State University Plane Wreck trip report on Mountainouswords.com. Remains of the 1970 Wichita State plane wreck with small memorial flags. Staying on the main road/trail leads deeper to the heart of Dry Gulch. Eventually, the informal trail will dissolve into the trees and the rest of your exploration will be off-trail. Among the options is a steep-but-solid hike up 12,705 ft. Mount Bethel. Bethel is known for its impressive snow fences that were put in place to prevent drifting snow from forming avalanches that could potentially slide down to the highway. Up close, these ten-foot high fences are quite impressive — and the views from the summit aren’t too bad either! The most direct line via a bushwhack up the south ridge/slopes of Bethel is about 1.6 miles one-way. Connected to Bethel is an unnamed peak, UN 12,671. This modest summit has great views into Herman Gulch and makes for a fun loop when connected with Bethel (or just tromping around). 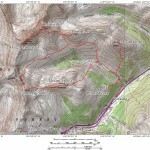 The saddle between Point 12,671 and The Citadel. Perhaps the most stunning feature at Dry Gulch is the imposing tower of rock known as “The Citadel”. 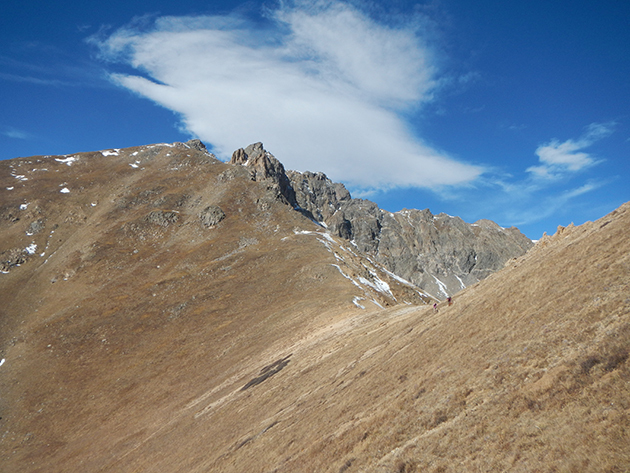 At 13,294 ft. it is technically an unnamed point between Pettingell Peak and Hagar Mountain. From a distance, the path to the summit looks rather technical. However, the hidden western face offers two accessible class 3 scrambles, one to each of the twin summits on the mountain. Ambitious climbers can link over to 13,220 ft. Hagar Mountain, a fun class 3 scramble from the Citadel (note that it is possible to simply bypass the Citadel en route to Hagar). 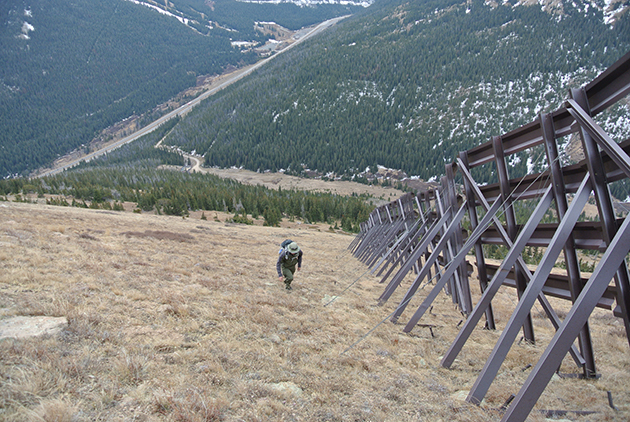 Mount Bethel’s snow fences with I-70 below. 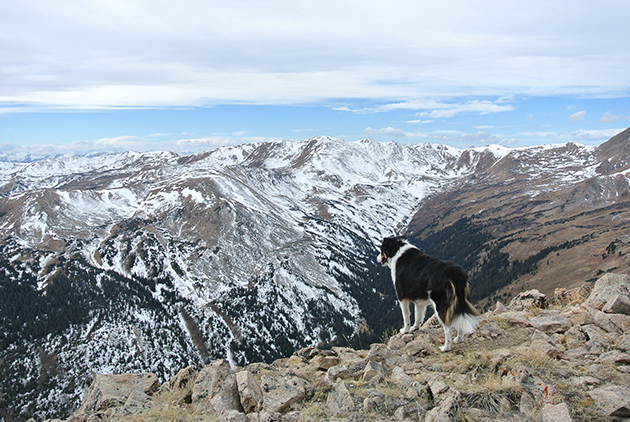 The west and south edges of the basin are a series of rolling summits, topped by 13,010 ft. Golden Bear Peak. This ranked 13er is the 634th highest of the 637 13,000 foot peaks in Colorado. The Loveland Ski area is on the hidden south side of the Dry Gulch summits, a ring of rolling terrain that concludes with 12,477 ft. Mount Trelease. Overview map. Click for a larger version. Keep in mind it’s not just peakbaggers who will enjoy this area. There are lots of creeks and nimble streams that course down into Dry Gulch. Simply wandering around this relatively undeveloped area can be a peaceful change of pace from other nearby mountain trails. Backcountry skiers and snowshoers enjoy this area as well, though it is prone to avalanches. Come summer, Dry Gulch is a nice retreat for those looking for a quick camping trip close to the Denver/Boulder metro area. Elevation Outdoors contributing editor James Dziezynski is the author of Best Summit Hikes in Colorado. Visit his Mountain Air Blog or follow him on Facebook and Twitter.